(NASA) – After repair attempts over the weekend, the Zvezda service module toilet experienced additional difficulties Tuesday morning. A toilet malfunction last week was initially repaired by replacing a micro-processor valve. The station crew members were directed to use Soyuz toilet facilities at first and are now using the main toilet again after rigging a urine bypass. Several other backup solutions are available. Ground specialists continue to troubleshoot the problem. Russian engineers are working with NASA to add spare toilet parts to space shuttle Discovery’s manifest before the May 31 launch. 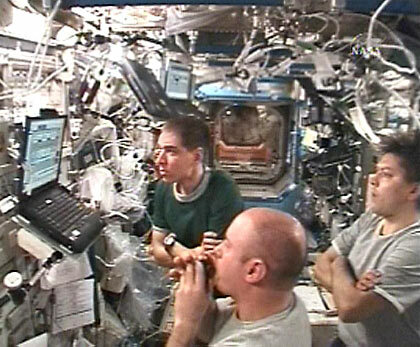 Meanwhile, the station crew continues preparations for the upcoming STS-124 mission. Commander Sergei Volkov and Flight Engineer Garrett Reisman practiced photography techniques they will use when Discovery performs a Rendezvous Pitch Maneuver – a back-flip – before docking with the station on Monday, June 2. Photos of the shuttle’s thermal heat shield will be downlinked to specialists for detailed analysis. The crew also reviewed the mission timeline during a conference with U.S. planners on Tuesday morning. Over the weekend, the crew members had an off-duty day on Sunday, performed their normal maintenance tasks and worked with ongoing science experiments.